The chart opposite lists the important effects of global warming and climate change on agricultural food production, both positive and negative. For food security we must focus on the negative aspects. The negative adverse effects predominate in number and overall effect. The higher the global temperature increase the more the negative effects predominate. Increasing the CO2 in the air potentially has a beneficial fertilizer effect on crops. However this only applies to some crops and for those global warming may have a modest and brief benefit (IPCC 2007). There is no question at some level of warming from heat damage alone any CO2 benefit will be negated. Tropospheric (or ground level ozone) is increased with increasing temperatures and is toxic to green plants. This makes for double damage to crops from global warming. The very many Impacts that are not included or poorly represented in the climate crop computer models (according to the IPCC) are indicated by a red cross. 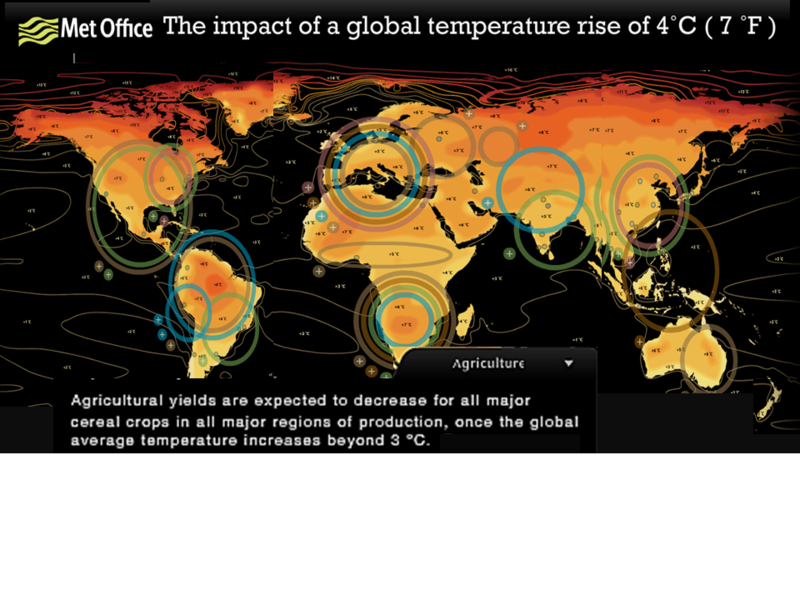 The absolute limit of crop tolerance in all regions is a temperature increase of 3.0C (see Met Office NRC and IPCC). However this relies on vary inadequate climate crop models, that do not capture a large number of large adverse impacts and so that should not be relied on for food security under climate change. 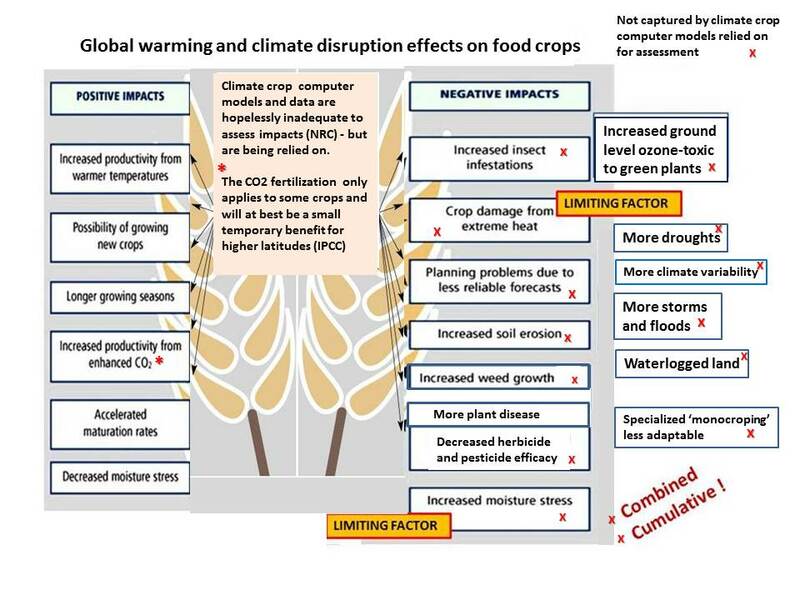 Due to the number of highly significant inevitable adverse impacts which are not included or inadequately included in the climate crop models, the assessment results given by the scientists should be assumed to be large under estimates. The 2010 National Research Council assessment points this out by saying the following. 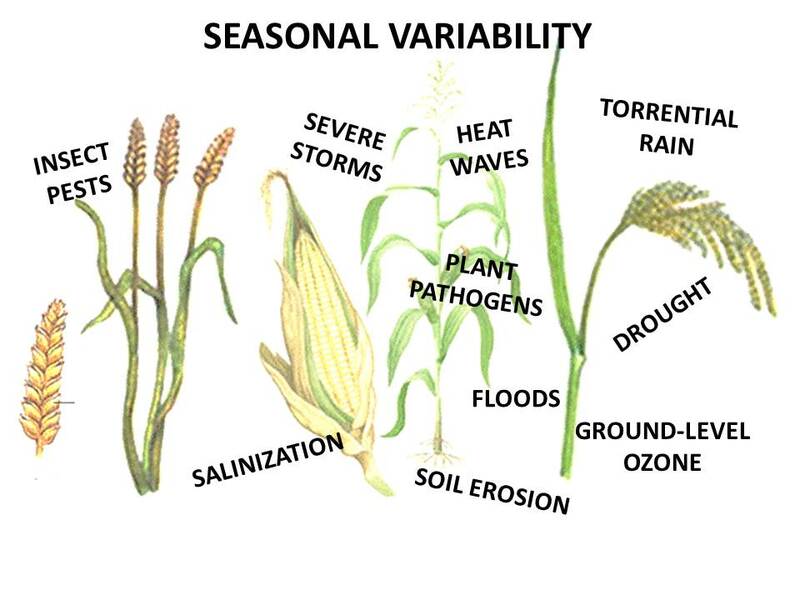 Crops develop more quickly under warmer temperatures, leading to shorter growing periods and lower yields, and that higher temperatures drives faster evaporation of water from soils and transpiration of water from crops. Atmospheric greenhouse gas pollution causes the following that all impact adversely of food productivity and food security. They are global warming, global climate change, climate variation, heavier precipitation, more floods, more severe storm, more cyclones,more heat waves and sudden temperature spikes, increased tropospheric ozone, ocean acidification (with ocean warming)and sea level rise, more weeds, more insect pests (+ more pesticide resistance),more plant diseases. Adverse human health climate change impacts will have a large adverse impact on food production where it is labour intensive. Many of them will impact on a local or regional crop all together. Increasing extreme weather events from global climate change are particularly hard to predict and particularly damaging. The end result in the real world is that the cumulative combination of all the impacts cannot be modeled. Temperature as surrogate for models. The scientists who design the computer models for climate and crops use the regional temperature increase as a surrogate for the CO2 fertilization benefit and the limited number of modelled adverse impacts as the temperature increases. They take a particular regional temperature increase and they correlate that with the atmospheric CO2 increase and adverse impacts of the higher temperature projected by their models. This does tell us what climate change damage to crops will happen in the real world of the farmer's field. If food security for humanity (all future generations) were a top concern in policy making there is another huge problem arising from the use of the models. That problem is the lag effect of an increase in the atmospheric GHG concentrations and the full amount of global temperature increase caused by it. 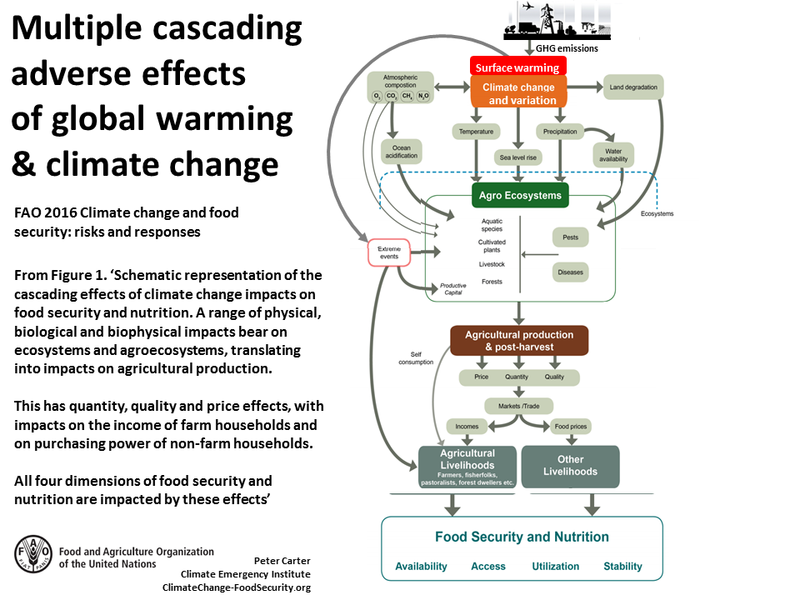 This fundamental aspect of the climate science is not accounted for in policy considerations for estimating climate change danger to food security. At any particular time, in the situation of continuing greenhouse gas emissions and continuing increase in atmospheric carbon dioxide, the global average temperature increase does not fully reflect the increased GHG heating at that time. The full amount of global temperature increase 'commitment' is more than double the temperature increase at that point in time. It's not hard to understand that the global climate change impact that is most harmful to agriculture is the one that comes under 'extreme weather events' category of the science. This which includes unusually hot days (that can damage a whole crop), heat waves , droughts, severe storms, torrential rain, and floods. Climate change increase in extreme weather events has already started (IPCC) and today's degree of global is committed to more than double. However the climate change assessment models do not capture extreme weather events and so they are not accounted for in the climate crop yield changes of the IPCC assessment.